This Middle Eastern casserole dish brings some of the locations best flavours in a spicy blend. Preheat the oven to 140/fan 120c. Heat half the oil in a large casserole dish, big enough to fit your shoulder of lamb. Season the lamb with salt and black pepper and brown all over. Set aside. Heat the remaining oil in the casserole and fry the onions for 10 minutes until lovely and golden and soft. Add the garlic and ginger and fry for a further minutes. In a small dry pan toast the coriander and fennel seeds over a low heat until they smell fragrant. Add to the pan with the onion and stir in the mustard seeds. As soon as the mustard seeds start to pop stir in the ground spices and cassia stick and a little splash of the stock and stir for a minute. Pour over the remaining stock and add the tomatoes, tomato puree, sugar and vinegar. Season well and bring to the boil. Cover and place in the oven and cook for 3 ½ – 4 ½ hours until the meat is falling away from the bone. After 2 ½-3 hours have a little peek inside your casserole. If there is still quite a lot of liquid, remove the lid for the rest of the cooking time to help to reduce the sauce. You want it to be a lovely thick and slightly sticky sauce that will just coat the lamb. 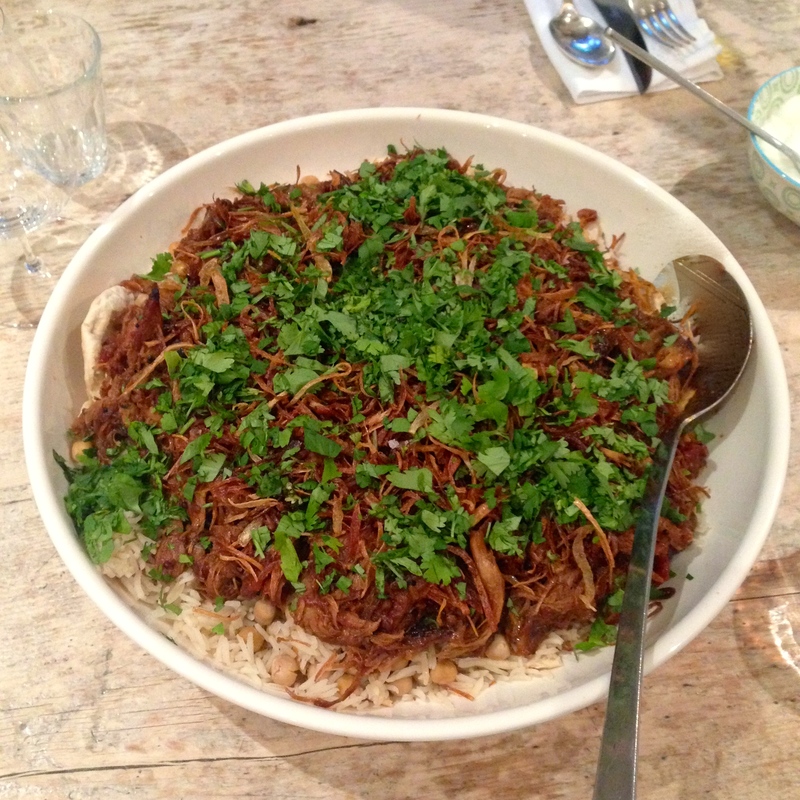 Whilst the lamb is cooking you can make the crispy shallots and pitta toasts. Put the shallots in a large pan and cover with a layer of oil. Cook over a low heat for 10-15 minutes, without stirring, until they are golden and crispy. Drain on kitchen paper and sprinkle with sea salt and set aside. Toast the pitta bread then split in half. Brush the insides with melted butter and sprinkle with sea salt the pop in the oven for 10-15 minutes until crisp. Once the lamb is cooked, pull the meat away from the bones in large chunks. Stir the meat back into the thick tomatoey sauce. Cook the chickpeas and rice in the stock with a good pinch of salt, covered, until all the stock is absorbed. Leave to stand with the lid off for a minute or two then fluff up with a fork. To serve, break the pitta bread into pieces and place on a large platter. Spoon over the cooked rice and chickpeas then top with the shredded lamb. Dollop over spoonfuls of yoghurt then sprinkle over the coriander and the crispy onions. TIP: If you don’t have a casserole dish you can brown your lamb in a heavy roasting tin. Use a frying pan to fry the onions, garlic and ginger then add to the roasting tin with the rest of the ingredients. Place the whole tin over a high heat and bring to the boil. Cover with a double layer of tin foil and place in the oven. Spices tip – Toasting your whole spices brings out their flavour. When your are toasting your spices it is worth doing extra so you can keep them in an airtight jar to use in other recipes.